paneer, oats and coriander greens croquettes with sesame coating. Does paneer also make croquettes? Why not? Paneer is such an convenient ingredient when it comes to quick recipes most of the times. Especially if you are not making the paneer from scratch that needs an extra 20 minutes or so. I find it easy to rustle up into a quick salad meal if in a hurry but I had never made a 'fried' snack with paneer apart from paneer pakoda which is not the quickest things to do. Although we are brought up on such pakods and rains somehow become synonymous with paneer and vegetable pakodas for us north Indians. No it's not a pakoda recipe, it's a croquette that is not deep fried in a pan full of oil. 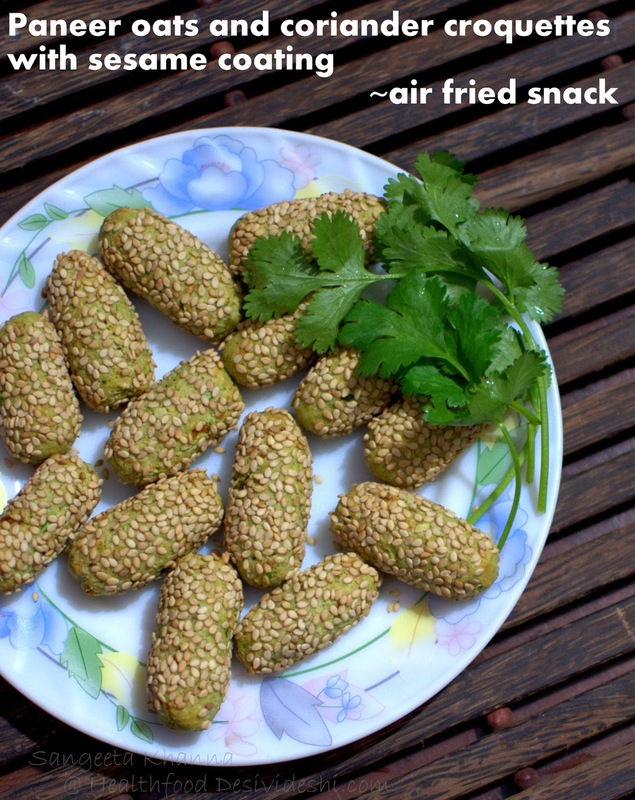 It is 'air fried'. I had agreed to try out the air fryer by Philips few weeks ago, and I did a few trials with chicken wings, beans, potatoes and sweet potatoes etc and found the gadget quite useful. But it had limited space in it's 'frying basket' and if there are more than 2 people in the family, you will be doing multiple batches of air frying. For some snacks and side dishes it will be good for a family of 4 too I feel. I found it particularly good for potatoes, sweet potatoes, chicken and fish apart from paneer recipe I tried. I will be sharing a few more recipes I did in the air fryer. This paneer and oats croquettes recipe is something I associate with convenience. A tasty snack that gets ready in a hurry and the frying is done without oil. Note that you can always shallow fry these croquettes in little oil or ghee, or bake them till browned, with or without a smearing of oil. 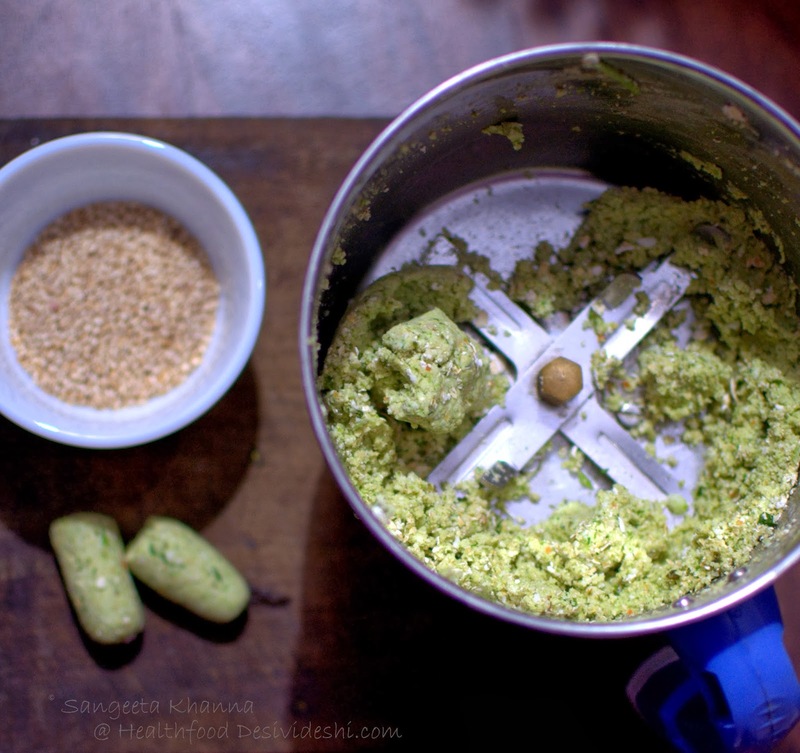 Blitz everything except sesame in the mixie or food processor till smooth and green. The mixture will be just right to be rolled neatly in small cylinders. Add a bit of milk if you feel it's too wet or a little oats if you feel it's too sticky. Adjust seasoning at this point. 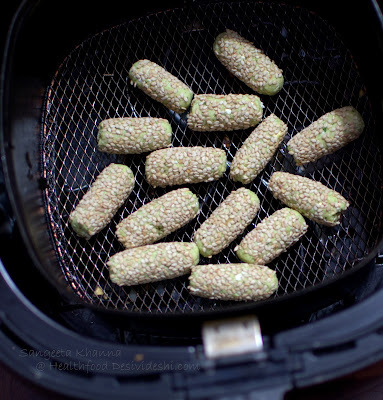 Roll the cylinders in sesame seeds and arrange inside the air fryer basket. 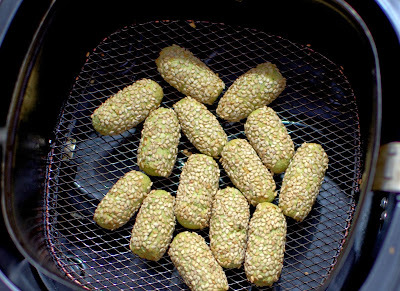 Air fry for 10 minutes on 180 C.
The sesame get nicely toasted and the crumb gets nice and soft. Full of fresh coriander greens flavours. I had some green chutney to have with it but we finished it on it's own. The croquettes make a nice finger snack with a dip or chutney on the side. I would love it with some cheese dip, a tomato based sauce or an evergreen coriander-mint chutney. 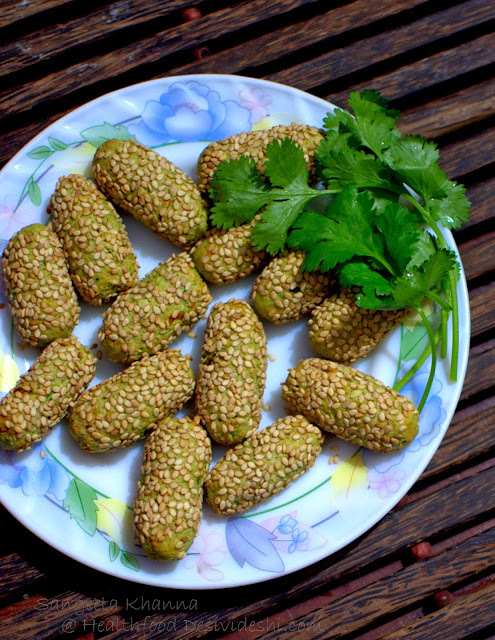 These croquettes look so inviting with sesame coating! love the look of it and the airfryer seems like a good gadget in the kitchen. would love to see more recipes in it. Oooh so yummy! I like the sesame on top. Must try them soon. You've put the fryer to good use!! Here's wishing you a very Happy, Healthy, Prosperous, safe and peaceful New Year.